Clean design and color photos make this TCMA's finest set from the 1970s. Their fronts closely resemble 1953 Bowman, just good pictures and white borders. Roy came from TCMA's first series of 1960s players, which totaled 293 cards. They added Series II in 1981, numbered 294 to 482. By count alone, you can guess it includes a wide variety of players, not just stars. 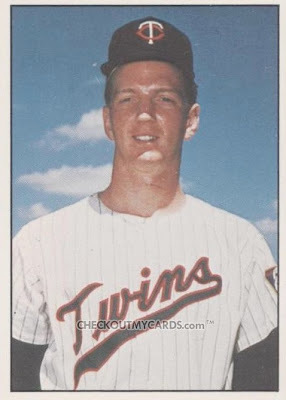 Jim Ollom fans, rejoice! 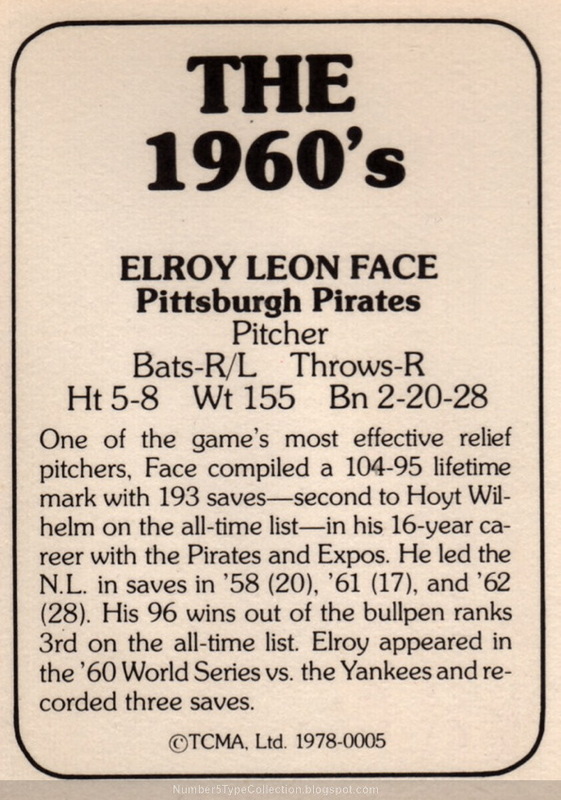 Wow, how did the bio leave out Face's amazing 18-1 record in 1959? Across 2 seasons, he won 22 games in a row! At least they acknowledge him as one of the game's best relievers. Roy started that amazing 1959 season with 17 straight wins, finally losing to the Dodgers on September 11th. 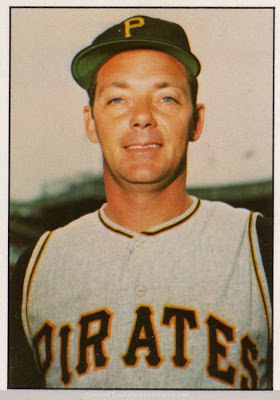 He entered the 1st game of a doubleheader up 2-1 and finished the 8th for starter Bob Friend, before allowing 2 runs in LA's 9th. Never one to fold early, Face pitched 4 innings on Sept 19 for win #18 and notched save #10 a few days later. 18-1 remans baseball's highest single-season winning % ever. Value: Less-heralded players from this set cost $1 or less. 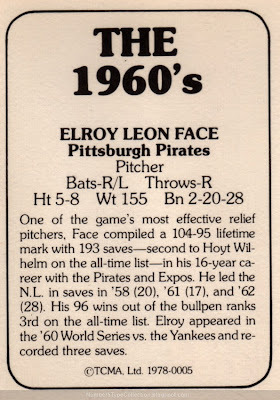 Roy garnered some HOF votes, but fell far short of actual election and dropped from the ballot after 1990. Fakes / reprints: TCMA probably sold 1978's first series until they ran out, but I don't know of any reprints.